My cross-cultural biography moving back and forth from Germany to the US challenged me in the early 80s with the question, how to make sense and give meaning to such privileged complex experiences living in and at times between these distinct Western cultures. “Multiculturalism” with all its socio-political implications, as well as the civic self-understanding of the actively engaged citizen constituting the strong, vibrant civil society in the US drew and occupied my focused attention for the years to come. The arts – well, I cannot imagine life without their emotional, spiritual, intellectual inspiration and enlightenment. My interest in a serious commitment for contemporary Native American art was triggered by a lecture given by the artist Jaune Quick-to See Smith in 1983 at the South West Museum in Los Angeles. Yet, it took me four more years of seeing and learning to feel ready for the complex issues of contemporary native art, while also exploring the art historic context and significance from my own Western perspective. Both cultural sensibilities established my cross-cultural commitment for acquiring and bringing this art to my country. It took me 25 years to give form to my seeing and perception by building the small Peiper-Riegraf collection highlighting Native American modernism and postmodernism.It was a commitment against all odds and in many ways it remains that way. De-accessioning by parting with works for the placement in museum collections in the USA and Germany. Only virtually can I hold on to the now lost wholeness of the collection and share all the works via this web site.The web site will be a long work in progress – texts, links and more information will be added over time. I hope for and invite comments, input and inquiries. In art historic reference to Max Ernst’s painting “Au Rende-vouz des Amis” from 1922 with Ernst’s Surrealist friends, I commissioned in 1988 a painting from David Bradley with a fictional gathering of Native American artists I had purchased works from, including my friends from Jemez Pueblo, the potters Marie Romero and Maxine Toya. 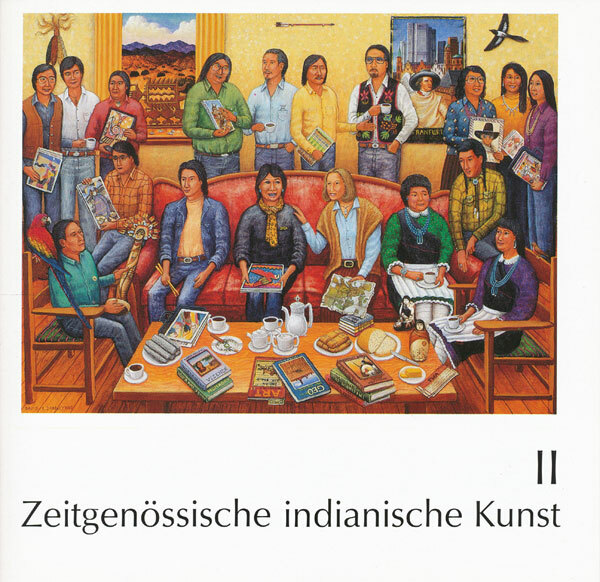 The painting served as the cover for my catalog published in 1989“ Zeitgenössische Indianische Kunst “II (Contemporary Native American Art II), which is a follow up on catalog I from 1986, and focuses with signature works on the beginning of building the collection. So they are all in this fictional gathering with revealing stories that go along with the art transfer from the American South West to Frankfurt, Germany. Delbridge Honanie (Hopi) David Dawangyumptewa (Hopi), Darren Vigil Gray (Jicarilla- ,Kiowa- Apache), Linda Lomahaftewa (Hopi), Dorothee Peiper-Riegraf (German) Marie Romero ( Towa Jemez Pueblo) Tchin( Blackfoot/Narragansett ) Maxine Toya (Towa Jemez Pueblo ). Rick Bartow is missing in the painting – it was not until late 1989 that I discovered him as a great artist. The title sets the paradigm for the intercultural dialogue through the arts – building bridges and acknowledging the cultural boundaries with distinctions.